• Review Implementation of Hyogo Framework for Action in Asia. Specific countries highlighted progress on the MDRD project, initiated in RCC4, and guidelines for mainstreaming DRR into development were reviewed. The program document on Phase II of the RCC MDRD project and partnerships for safe development and good governance covering the period of 2008 to 2012 were reviewed and endorsed. Implementation of the HFA in Asia for 2007—2009 was reviewed and preparations began for the 3rd AMCDRR held in Kuala Lumpur in December 2008. RCC 7 reflected the evolving perspective of CBDRM with a move towards community leadership for DRR; called for greater engagement, partnership and integration with local government mechanisms for DRR and development; affirmed the commitment of RCC members to take up national programs on CBDRM in all high risk communities; establishing scheme for recognition of good practices in CBDRM and utilizing experience of CBDRM award scheme in member countries. 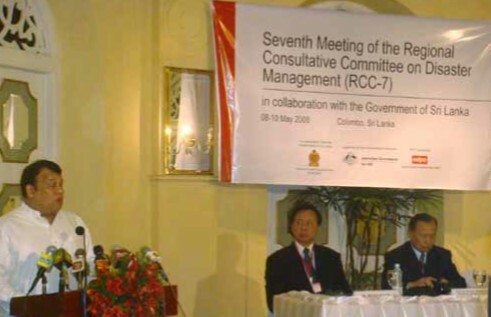 The RCC7 showed continued and enhanced partnership between regional agencies with a full-time focus on DRR i.e. UN-ISDR, ADPC and The Asian Disaster Reduction Center (ADRC). In addition, RCC agreed to endorse greater integration of RCC into the regional and global system namely linkages with AMCDRR and Global Platform for DRR. Moreover, the RCC meeting encouraged UN-ISDR, ADRC and ADPC to continue their dialogue on how the RCC meeting could serve in preparing for, and following up on Regional and Global Platform meetings.